What if someone told you that you can attain high level of proficiency (a level you admire, and aspire to achieve) in android development or writing or public speaking or a sport or any pursuit in 2-3 years. You’ll likely not believe. 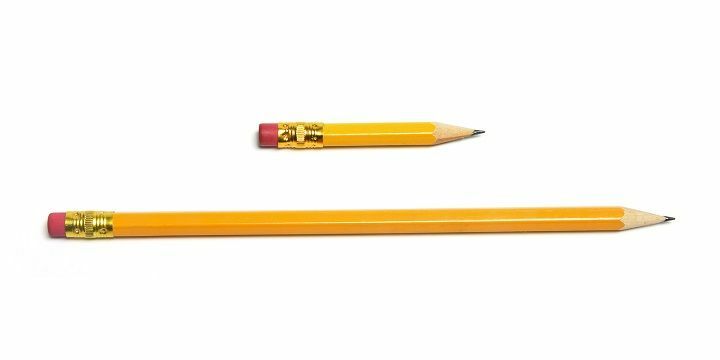 People, by and large, overestimate what they can achieve in the short term (say, 3-4 months) and grossly underestimate what they can in 2-3 years. Why this difference between what we think and what actually happens? It’s because we humans mostly think linearly… but, in reality, things compound. If you’ve studied basic math, this difference is similar to the difference between simple interest and compound interest. You know how fast the latter grows an amount compared to the former. I had a similar experience – not able to fathom the rapid progress I’ll make – improving my active vocabulary by more than 7,500 words and pronunciation by more than 3,400 words in under two years. What we’ve covered so far may sound bit abstract to some of you. So let’s take few examples to understand how human beings think and how things may actually grow. If you fold a paper of thickness 0.001 cm once, the resultant thickness will be 0.002 cm. If you fold it again, the folded paper would be 0.004 cm thick. How thick the paper would be if you could fold it 45 times? If you haven’t seen this problem before, it’s very hard for you to guess the answer. On the forty-fifth fold, the paper would hit the Moon! You can see the explanation of this problem on this YouTube video (duration: 3:48 minutes). Did you notice how fast the thickness ballooned from seventeenth to twenty-fifth fold? A result of similar compounding is what we use every day, smartphone. In 1965, Gordon Moore, the founder of Intel, observed that the number of integrated circuits on a transistor had been doubling every 12 to 24 months. He predicted this trend is going to continue in future for around a decade or so. The trend however continued way beyond a decade, and it’s a result of this compounded growth (doubling every 12 to 24 months) that the smartphone in your pocket is thousand times faster and million times cheaper than a supercomputer in 1970s. Because we mostly extrapolate linearly, realities which are rooted in compound growth can be dramatically different from what we expect them to be. 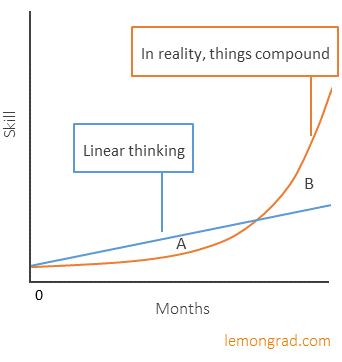 What are fundamentals of compounding? Let’s understand them through the formula for compounding. Here ‘P’ is the amount (or any other unit) at the starting point. It grows at an interest rate of ‘i’ per year for ‘n’ years to become ‘A’. If you aren’t improving regularly, which means ‘i’ is zero, then you stay at the same level, no matter how many years you spend practicing. In nutshell, if you want to get on a compounding curve, you need to be consistently improving over few years. Compounding is a universal law and it works everywhere, and not just in money-multiplying. If you’re struggling in the beginning, don’t lose heart. As long as you’re improving – and that’s the key word – you’ll hit the steep part of the curve in due course. If you look from distance at a person proficient at something, you may not even attempt the skill, thinking it would take too long. That’s a result of linear thinking. Posts regarding learning of English language were inspiring.. particularly for persons like me who come from rural area and struggling to learn English.. keep posting about English language and success stories of english learners who were not studied in english medium..